Posted on Fri, Feb 24, 2012 : 3:43 p.m. Since six of its 12 full-time firefighters are currently being paid for through a federal grant, the Chelsea Area Fire Authority is looking at what staffing levels it needs to maintain optimum service when that grant expires in August 2013. In June 2010, CAFA was awarded a competitive grant through the Assistance to Firefighters SAFER Grant Program and received $545,664 to hire six new firefighters for two years. CAFA must pick up the cost in the third year. The Assistance for Firefighters Grant Program is administered by the U.S. Department of Homeland Security’s Federal Emergency Management Agency. Now, the CAFA board must decide whether to retain all six, three or none of the firefighters that were hired through this grant. Currently, the fire authority has three shifts with four people on each shift and 24/7 coverage of the house with three full-time firefighters as well as 12 paid-on-call firefighters if needed. The staffing levels include a full-time chief, three full-time captains, three full-time lieutenants and six firefighters. By keeping three of the firefighters, Payeur said, there would be three full-time personnel on duty round-the-clock. CAFA also has a full-time chief, plus a part-time office manager, who works 25 hours a week. “We’d go back to the three-platoon system where a lieutenant and a firefighter would go out in the truck (for a medical call) and the captain would stay behind should there be a second call,” the chief said. If there’s a fire, all three would go out in one truck. In fact, keeping three of the six full-time firefighters is the least expensive of the three options. To retain six firefighters, it would cost about $931,000. Keeping three firefighters would cost about $787,000, and laying off all six and using paid-on-call personnel would cost about $849,600 when benefits are included. Plus, the chief said, there would be a lot more training costs to go back to using the paid-on-call system. CAFA responds to about 1,300 calls per year as a 1A or basic life support level fire department. About 50 percent of the calls are emergency medical service related, while about 50 percent of the calls are for fires and vehicle crashes, he said. The authority serves the city of Chelsea and Sylvan, Lima and Lyndon townships, as well as a small portion of Dexter Township. Since 2005, the SAFER grant program has helped 1,321 fire departments, 28 in Michigan with the goal to help local fire departments comply with national staffing, response and operational standards. The grants were created to provide funding directly to fire departments and volunteer firefighter interest organizations to help increase the number of trained, “front line” firefighters available in their communities, according to information about the grant. Thu, Mar 1, 2012 : 4:23 a.m. The original 6 fulltime members were all from CAFA in fact any hiring CAFA had done for firefighters who left were all done from within. CAFA accepted the SAFER Grant with the intent to possibly staff the Dexter Township station with two personnel and an engine, Dexter Township however elected to go DAFD with one FF and an engine. Each CAFA member hired from the SAFER Grant were made aware that at the end of the 3 years some or all may not have a job. Some turned away when told this even the 6 that stayed are working happily doing what they love for as long as they can and just hoping for the best at the end of this but yet appreciating the opportunity none the less. People make sacrifices to do what they love and I can remember the way I felt April 1, 2006 when I made the decision to do what I had only dreamed about and it made no difference to me that Id only be making 28,000 dollars a year. You see I was finally doing what I loved and while those members some with their "Brass" are still spiteful and disrespectful to the department they once so "proudly" served I couldn't be happier or more proud! 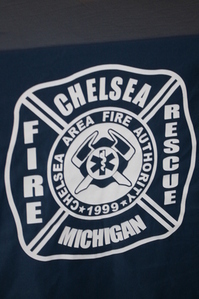 So no matter what happens at the end of this grant know this, the Chelsea Area Fire Authority is far better off as an organization today PROUDLY serving this great community 24 hours a day 365 days a year and that's the TRUTH! Thu, Mar 1, 2012 : 4:22 a.m.
Sun, Feb 26, 2012 : 8:50 a.m. Both previous comments bring forth some very valid points. Why does such a small department have such a top-heavy (i.e. costly) command system? Can't one Captain command 2 Firefighters, that is certainly within his span of control. I also would have to question the sense of having the Captain stay behind &quot;in case there's a second call&quot;. That sounds like it makes for a pretty cushy job for the captain, since the figures show there is only about 3.5 calls a day, spread over 24 hours. Fireadvocate is right on the money. No way can those figures be correct. What benefit package does a paid on-call firefighter get? Do they have Vacation time, Health Ins. etc? How could equipping and training 12 people called in only for the big calls cost so much? I wonder what this Fire Administrative Board was thinking when they accepted the grant? They KNEW that there was no funding for these personnel beyond the grant's life. It seems that they either hired &quot;disposable&quot; firefighters, knowing that they would throw them to the curb in a few years, or they secretly intended to come to the community hat in hand asking for ANOTHER fire millage to keep these folks, using scare tactics to goad the public to vote for additional staffing. You'll find that the Cities of Jackson, Adrian, Tecumseh, Hillsdale and sometimes Ypsilanti have 4 or less people on duty around the clock, and they are as busy (if not more) than Chelsea, with more population. The Departments in Saline, Superior, Ann Arbor Twp or Dexter don't have that many staff on duty either. Lastly, how does the Department decide who would be laid off? Will experience, seniority or training be used to decide who stays and who goes or will be a popularity contest? Maybe we need a second opinion on this. Many questions remain unanswered in this issue, and we need to ask them before any decisions are made. Sun, Feb 26, 2012 : 2:19 a.m. The $849,600.00 figure has to be scrutinized. I would think this is a drastically inflated number that has been manipulated to sway the board away from using paid-on-call staff. Somebody needs to talk to the other POC departments in the area (and elsewhere) to evaluate true costs. Either the number of POCs that are included is really high or there is some other factor that drives the final figure. There is some struggle in doing a true comparison between full-time numbers and POC numbers, but it can be done. Had the board thought this through in recent years they could have prevented the erosion of the CAFA Paid-on-call system that has occurred. There has been an orchestrated effort to eliminate the POCs and now it would appear that the cost to revitalize this very functional and efficient method of supplementing full time firefighters, on the surface, is substantial. Look deeper before you give up on the POC program. Sat, Feb 25, 2012 : 8:17 a.m. The math looks lime there is more command officers than firefighters. Get rid of some of the brass, hire firefighters (cheaper than command officers) and for any major incident there should always be some type of command showing up. For everyday runs and crashes, I would imagine the firefighters can work with each other to handle everything.